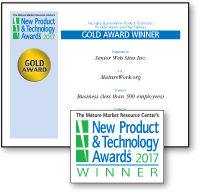 The 8th Annual New Product & Technology Awards, organized by the Mature Market Resource Center [sm] (MMRC), recognizes innovative products, services, and technologies for older adults and their families. The competition also includes recognition of web-based and mobile resources — websites, social media, e-newsletters, mobile applications, and more. For 27 years, the MMRC has organized the National Mature Media Awards [sm], the largest awards program of its kind to recognize the nation’s best educational and marketing materials for older adults. Recently, nearly 1,000 entries were submitted for this competition, from hundreds of national, state and local organizations and companies throughout the United States. The New Product & Technology Awards is a companion recognition program for products, services, and technology. Gold, Silver, Bronze and Merit certificates will be awarded by Divisions and Categories. Using a rating scale of 1-100, a panel of national experts will review entries and assign scores for recognition. The 2018 New Product & Technology Awards entry fees are $59 or $79 (USD) per submission, based on entry category. A limited number of category-exclusive national sponsorships are still available for the 2018 competition. Sponsors receive exclusivity for their brand category, free entries for the 2018 competition, charter sponsorship for the new “Seniors & Robotics” e-newsletter coming this summer, and a number of other significant benefits. 2018 New Product & Technology Awards sponsors will also be charter underwriters of the inaugural New Product & Technology Awards Senior Showcase, the first-ever consumer exhibition of entries submitted for the 2018 competition. This display will give older adults and their families the opportunity to review the latest products, services, and technologies from organizations that have entered the 2018 awards. The first “Senior Showcase” will be held in the Chicago area in summer 2018. Click here for more information about 2018 New Product & Technology Awards Sponsorship Opportunities, or contact Gary W. Ford, managing director, Mature Market Resource Center: gford@agingawards.com or 1-800-828-8225. © 2017 Mature Market Resource Center. All Rights Reserved.